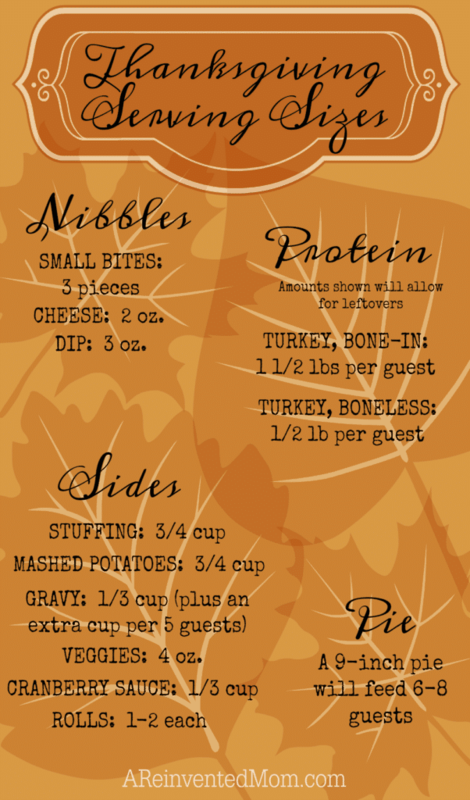 Use this helpful Thanksgiving Dinner Serving Sizes guide to successfully plan your holiday feast. Like many of you, I’ve been working on my menu and shopping for the upcoming Thanksgiving feast. As important as it is to create the perfect dishes, it’s equally important to ensure you have enough food to feed your guests. What could be worse than not having enough gravy, turkey or (gasp!) pie? 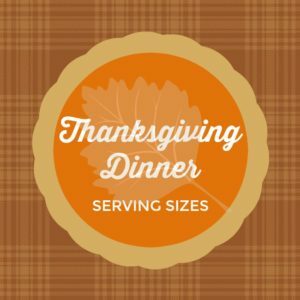 Today I am sharing a guide for Thanksgiving Dinner serving sizes in the hopes of taking the guesswork out of the age old question – how much food should I prepare? PROTEIN: amounts will allow for leftovers – you gotta have a turkey sandwich, right?! A 9-inch pie will typically feed 6-8 guests. Unless one of those guests is a 16 year old, pumpkin-pie-loving-boy. Then you should plan on preparing 1 pie (yes, an entire pie!) solely for the aforementioned 16 year old boy. Doing so will allow your remaining guests to also enjoy a slice of pie. I hope you have a wonderful Thanksgiving, filled with family, good friends and good food. This post may contain an affiliate link(s). If you choose to click on the link and/or make a purchase, I may be paid a small amount. All opinions are my own.